There is a battle that has been waging for 2000 years. Countless have been wounded, the casualties are without number. The battlefield is bloody and littered with the bodies of fallen soldiers. We are in a war that has affected every single one of us. Many in our very own church, I’m sure have been wounded—maybe wounded several times—maybe wounded even this week. And who is this enemy we are fighting? This is the most surprising aspect of this war. The enemy we are engaged with is … ourselves. We are fighting other members, other brothers, other sisters of the family of God. We have spies who dig up dirt on people. We have snipers who smugly attend church then fire their rounds during the week. We have sergeants and lieutenants who lead their own little platoon of followers to accomplish their own little missions. We have rules of engagement about what we can and can’t say to whom. And we set our little booby traps for people to walk blindly into. Let me explain what I mean. This war is a war of relationships. Because of sin, our inter-personal relationships have been damaged. We speak harshly to each other. We judge each other. We gossip about each other. We argue with each other. We kill our wounded. It’s the worst war in history, because no one has been left unaffected—and the worst part about it is that we are supposed to be loving and accepting of each other. How do we ever expect to win against the world, if we can’t even be at unity and peace amongst ourselves? Previously, we saw the battle the Ephesian church was waged in. It was a battle between Jews and Gentiles. We have scrimmages today, but the war rages on. We don’t fight—at least not usually—about the place of Jews and Gentiles in the church. Today, we fight about dress codes, and holidays, and decorations, and eating habits, and music styles and so on. So while this passage is primarily about the relationship between Jews and Gentiles, it very easily applies to us as well. Today, Paul tells us what God has done to bring peace to our relationships. Chapter two of Ephesians is all about our new position in Christ. Ephesians 2:1-10 is about our new position individually, Ephesians 2:11-22 is about our new position corporately. And Paul addresses each the same way. He begins with what things were like before we were saved, and then he moves into how Christ brought change. Ephesians 2:11-12 reveals what our relationships were like before we were saved. Ephesians 2:13-17 explains what Christ has done about it. We were at war with each other, God wants us to be at peace with each other, and to do this, he became the mediator. Ephesians 2:13-17. 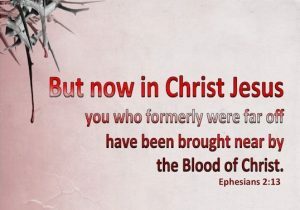 But now in Christ Jesus you who once were far off have been brought near by the blood of Christ. For He Himself is our peace, who has made both one, and has broken down the middle wall of separation, having abolished in His flesh the enmity, that is, the law of commandments contained in ordinances, so as to create in Himself one new man from the two, thus making peace, and that He might reconcile them both to God in one body through the cross, thereby putting to death the enmity. And He came and preached peace to you who were afar off and to those who were near. These verses tell us what Jesus Christ has done to bring peace to our relationships. They tell us of our new position corporately. If you’re following along in your sermon outline, you can see that I have organized it in a way many of you have probably not seen before. This type of organization is something that was very popular in the time of Paul. In fact, it is a favorite structure pattern of Paul’s writing. He uses it dozens of times throughout his letters. Since it is so important, let me explain it to you real briefly. The structure itself is called a chiasm. The basic structure is that the writer begins with a point and then makes various subpoints until he gets to the main point of the verse or paragraph. Then, once the main point is reached, the writer works his way back out again, going in reverse order from the way he arrived, so that he ends with where he began. That sounds a little confusing, I know, but it much easier to see than to explain. So you’ll need to look at your outline to see how Paul has done this. All you have right now is the structure, but as we go, you will fill it in. He begins with his point A, then goes to point B, he has three things to say about B, and he says them, 1, 2, 3. Then he repeats point B, which, because it is in the center of the chiasm and because it is repeated three times, is the main point of the paragraph. Then, having stated his main point, he works his way back out in reverse order. He states his three points about B again, 3, 2, 1, then restates B a third time, and ends with point A. As a general rule of thumb, when you are reading the letters of Paul, and he seems to repeating himself a lot, it might be a clue that he is using a chiasm. Get out a piece of paper, and see if you can discover it. Let’s begin with Paul’s thought flow by looking at Ephesians 2:13. Ephesians 2:13. But now… Do you remember in Ephesians 2:1-3, Paul told us of the horrible condition we were in, then he began Ephesians 2:4 with the words, But God to show us what God had done for us? I made a big deal about this little word “But” in Ephesians 2:4. The same emphasis could be given here. Paul has just told us what we were like as unbelievers, and then he begins Ephesians 2:13 with the words, But now. He is keeping his parallelism here. Jesus Christ has accomplished something for us in our relationship with God and our relationships with other Christians. Let’s see what he has done in our human relationships. This is point A in your outline, and it is a summary of Ephesians 2:13-17—a summary of what God had done for us in Jesus Christ. The summary of What God Has Done, is that those who were once far off have been brought near. The far have been brought near. What does it mean to be far off? Paul explained this in Ephesians 2:11-12 which we looked at last week. Remember, Paul listed six ways in which they were far off. They were without respect, without Christ, without citizenship, without covenants, without hope and without God. As unbelieving Gentiles, they were far off. A rabbinic writer tells of an incident that explains the common Jewish attitude toward Gentiles. He mentions that when Gentiles converted to Judaism, as they sometimes did, it was called “being brought near.” A certain Gentile woman came to Rabbi Eleazar, confessed that she was sinful, and told him that she wanted to become righteous. She wanted to be accepted into the Jewish faith because she had heard that the Jews were near to God. The rabbi is said to have responded, “No. You cannot come near,” and then shut the door in her face. That is the way it used to be. But now, Paul says in Ephesians 2:13, in Christ Jesus (there’s that favorite term of Paul’s again—in Christ Jesus) the Ephesian Gentiles, who were far off have been brought near. 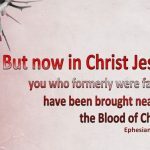 And Paul says here that this bringing near was accomplished—not on their own merit, or because some of them were real likable people—no, it was accomplished by the blood of Christ. The sacrifice of Christ by which He gave up His life for others. It is by the blood of Christ that those who were far off have been brought near. And Paul doesn’t say here exactly what it means to be brought near, but we can assume that it means basically the opposite of what it means to be far off. Being brought near is the opposite of the six things listed in Ephesians 2:11-12. Right now, Paul just wants to tell us how Jesus Christ brought us near. And, as I mentioned, he does that with the use of a chiasm. Point B in your chiasm is found in Ephesians 2:14. He Himself is our peace. B in your chiasm is Christ is Our Peace. The only way people can be at genuine peace with each other is in Christ. Paul’s choice of terms here is interesting as well. There is, in the Greek, a term for peacemaker, but Paul did not use it here. Jesus Christ did not come to bring peace and then to retire to the sidelines as a peacemaker does. He came to be our peace. Christ is our peace. He brought peace. He came so that we might be at peace with each other. Now remember, Paul is primarily talking here about the relationships between Christian Jews and Christian Gentiles. That includes Israelite Christians and the Palestinian Christians. People are trying to bring peace in the Middle East right now, but the only way for that to happen is to bring both to Christ. Peace will not come in any other way, because He Himself is our peace, and has made both one. Paul says in the last part of Ephesians 2:14 that Jesus Christ has broken down the middle (or dividing) wall of separation. This term is a reference to the temple at the time of Paul. There was, in the temple, an outer court called “The Court of the Gentiles.” It was as far into the Temple as the Jews would allow Gentiles to come. They could go no further. 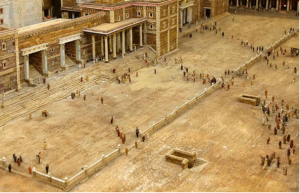 The Court of the Gentiles and the rest of the temple was divided by a middle wall of separation. “God had originally separated Jews from Gentiles (cf. Isa 5:1-7; Matt 21:33) for the purpose of redeeming both groups, not for saving the Jews alone. He placed the Court of the Gentiles in the Temple for the very purpose of winning Gentiles to Himself. It was meant to be a place for Jewish evangelism of Gentiles, a place for winning proselytes to Judaism and of thereby bringing them “near.” It was that court, however, that the Jewish leaders of Jesus’ day used as “a robbers’ den” (Mark 11:17) rather than as a place of witness.” It was not being used as God intended. There was this middle or dividing wall of separation. Paul uses this as a symbol for the racial hatred and hostility that many Israelites have for Gentiles, and many Gentiles have for Israelites. It is a wall between the two. In fact, Paul had firsthand experience with this dividing wall of hostility. In Acts 21, this is the exact reason he was arrested in the first place. He was falsely accused of taking Trophimus, a Gentile from the city of Ephesus, past this barrier. This is probably why Paul mentions this barrier in his letter to the Ephesians, because they know that this is why he was arrested and is now in prison. But, Paul says Jesus Christ has torn this wall down. Just like when He died on the cross, the veil in the temple was torn from top to bottom, showing that the dividing wall between God and man had been breached, Jesus Christ has also made it possible for all to come before God—Jew and Gentile alike. Christ is Our Peace. Ephesians 2:15 tells us how Jesus Christ accomplished this. Ephesians 2:15 contains the next four lines of the chiasm. The first is the word enmity. Christ, when he came, abolished in His flesh the enmity that existed between Jews and Gentiles. You might say, “Where did this enmity come from?” Well, look in the verse. It tells us that the enmity rose from the law of commandments contained in ordinances. In other words, much of the malice that is between Jews and Gentiles is a result of the Jewish law. We have seen previously that the law contained over 6000 rules and commands. Among these, were laws stating that the Jew was to have nothing to do with Gentiles, was not to associate with them, or get involved in any of their practices. Needless to say, this created strife and division between Jews and Gentiles. But Paul says here that Jesus abolished all of this enmity that was created by the law. Maybe some of recall Matthew 5:17 where Jesus says He did not come to abolish the law. How does that fit with what Paul says here? The answer is found by carefully understanding what Paul says in Ephesians 2:14. According to Ephesians 2:14, Jesus did not come to abolish the law, but to abolish the enmity that existed because of the law—the enmity created by the law. In Matthew 5:17, Jesus did this by completely fulfilling the law. He is superior to the law, and proved it by fulfilling the law. This is number 2 in your chiasm, Jesus created peace in Himself by fulfilling the law. Here is Paul’s favorite idea again: everything we have and everything that is done for us is done in Jesus Christ. So Jesus abolished the enmity that was created by the law. The law set up a system of rules and regulations which allowed people to feel superior than others and more righteous. Though the purpose of the law was love, most people used the law to judge, condemn, and accuse. So the law ended up causing the exact opposite of what it was intended for. It was used for hate instead of love. It created enmity instead of unity. And this is what too much of an emphasis on the law does for people, even today. Those who are most zealous for their religious laws and commandments end up hating, judging, accusing, and condemning those who are not as zealous. A religious focus on law causes those who obey the law to look down their noses with scorn and division at those who do not obey it. Jesus came, says Paul, to do away with this enmity caused by the law, and in this way, bring together those who had been separated by the law. This is what Paul explains next in Ephesians 2:15. Jesus abolished the enmity of the law to make one new man from the two. Number 3 in the chiasm, He made the two into one. He made the Jew and the Gentile into one body—the body of Christ. Marriage is a wonderful picture of this—when the two become one flesh. Paul picks up on this picture later in Ephesians 5. We will deal with it then. So far in the chiasm then, we have what God has done: the far are brought near, and he did this through the peace of Christ by abolishing the enmity, in Himself, and making the two into one. As I was preparing this message, I was reminded of the story of Romeo and Juliet. Romeo and Juliet, you remember, were the children of two families that hated each other. There was enmity between the two. There was a blood feud between these two families, and they were intent on destroying each other. But in the Shakespearean play, Romeo and Juliet met and with the help of a priest, got married. The two became one. But in the play, the story ends in tragedy. It ends with both of them dying. The story of Jesus’ coming, however, ends well. The end of Ephesians 2:15 says thus making peace. Christ made peace between the two factions. He has taken the two families—Jew and Gentile—and having abolished the law of commandments, created in himself one new man—created in himself the church. Peace is the central idea of Paul’s thought pattern here. It is the central point of the chiasm. B prime is that Christ Makes Peace. Christ is our peace by abolishing the enmity in Himself and making the two into one. In this way, Christ makes Peace. So now, having worked his way to the center, to complete the chiasm, he needs to work his way back out again. The second half is really a mirror image of the first half. Let’s see this by looking at Ephesians 2:16. Ephesians 2:16. and that He might reconcile them both to God in one body through the cross, thereby putting to death the enmity. Ephesians 2:16 contains points 1, 2 and 3 in reverse order. Paul says that He might reconcile them both to God in one body. This is a repeat of point 3. He made the two into one, and he reconciled both to God in one body. It is the same idea, just phrased a bit differently. And notice the minor difference—how Paul elaborates on what he said before. The goal was not just to have these two bodies be reconciled to each other, but to reconcile them both to God. The differences we have with each other cannot be worked out if we just sit down and talk them over. The differences we have with each other can only be reconciled with each other if we are first reconciled to God. This is point three repeated. He made the two one. He made both into one body. Second, Jesus Christ did this through the cross. In Ephesians 2:15, Christ did it in Himself, here Paul repeats himself again, but elaborates as well. It was not just in Himself, it was specifically in what He did on the cross. Jesus Christ accomplished this through H death on the cross. On the cross, Jesus revealed what we humans have been doing from the beginning of time. Jesus went to the cross because the people who crucified Him thought that He was a blasphemer and sinner. They thought that He broke God’s law, profaned the religious temple, and undermined the priestly authority and the sacrificial system. So they looked down their religious noses at Jesus, and killed Him in God’s name. But then, rather than retaliate from the cross, what did Jesus do? He asked God to forgive those who crucified Him (Luke 23:34). On the cross, Jesus revealed how to create peace where there is only enmity, blame, accusation, and strife. The way to peace, Jesus revealed, is to forgive. This is what Jesus did on the cross, and what He revealed to us through His death and resurrection, and is how He now calls us to live our lives as His followers. This is the last idea in Ephesians 2:16, and a repeat of point number one. In Ephesians 2:15, Paul began by talking about the enmity that existed, and here in Ephesians 2:16, Paul concludes by talking about the enmity which was put to death in Jesus Christ on the cross. He showed us the way to peace and calls us to live in this way. So you can see in our chiasm, that Paul began with What God has done for us. He brought peace. Paul works his way into the main idea by listing three things, and then we see that the main idea is peace, and now Paul has worked his way back out. So, to complete the chiasm, he needs to repeat the introductory points of his chiasm. And this is exactly what he does in Ephesians 2:17. Ephesians 2:17. And He came and preached peace to you who were afar off and to those who were near. Christ came and preached peace. This is what Christ came preaching, isn’t it? By the way, this is a fulfillment of Isaiah 57:19, which says that the Lord will say “Peace, peace to those far and near.” (cf. also, Isa 9:6; 52:7; Mic 5:5; Zech 9:9-10). Christ came preaching peace—a peace such as the world had never seen. Peace. The final point B in our chiasm is that Christ Proclaims Peace. This is the third time Paul has mentioned peace. And in some versions, Paul places double emphasis on peace here because in the Greek, the word peace is in here twice. If you’re using the NAS, the NIV, or the NRS, you will see this in your translation. We’ve almost worked our way back out of the chiasm. At the end of Ephesians 2:17, Paul ends with what he started with: what God has done, he has brought peace to those who were afar off and to those who were near. And with that, the chiasm is complete. Paul has worked his way all the way in and all the way out. And now that your outline is complete, we can easily see how beautifully the passage has been structured. Last week we saw the problem: our relationships are in shambles; we are at each other’s throats; we can’t get along; we are at animosity with each other. The passage before us in the solution to this problem. And Paul has so arranged it so that we cannot miss it. What has God done for us? He has brought peace, Peace, PEACE! From this passage it is clear what Paul is saying. We, who used to live at enmity with each other, and used to judge each other by our own moral standards and laws of conduct, we—whether we were far off from God or near to God, we can all, in Jesus Christ and through what He has done on the cross, we can live at peace with each other. Why? Because we are no longer separated. In Christ, we have become one body. One flesh. One. So, when members of Christ’s body fight among themselves, we are really only hurting ourselves. We are gouging our own eye. We are cutting off our own hands. We are shooting ourselves in our own foot (1 Cor 12:14ff). When they first come up with this idea, they are in a bar, so they decide to start right away, and they go out into the parking lot to fight each other. As they do, a crowd gathers and watches in utter amazement, not trying to stop the fight. The end of the movie reveals that the two men are really just the two different personalities of a single schizophrenic man who somehow is able to be both personalities at once. And the movie does a flashback to that first fight in the parking lot of the bar to look at it through the eyes of the crowd. To them, it is a comical yet confusing scene. From the crowd’s perspective, they see one man beating himself up. He’s throwing himself into cars, and punching himself in the face, and knocking himself to the ground. Somehow, he’s able to bite and kick himself. It is not a pretty sight seeing a man beat himself up. But that is how much of the world views the church. Here we are, the body of Christ, we are supposed to be loving and unified. We are supposed to be living in the peace that Christ has provided and that the whole world wants. We are supposed to protect each other as we protect our own bodies. But instead, we spend much of the time beating ourselves up just like that man in the movie. We have racial differences. We have political differences. We have class differences. We have theological differences. And if we let ourselves focus on these differences, we would spend all of our time beating each other up. I was walking across a bridge recently and spied a fellow who looked like he was going to commit suicide by jumping off. So, I thought I would try and stall him until the authorities showed up. “Don’t jump!” I yelled. “Yes, I believe in God,” he said. “Good, Are you Christian, Jewish or Muslim?” I said. “Conservative Independent Baptist,” he said. “Calvinistic Conservative Independent Baptist,” he said. “Dispensational Premillennial Calvinistic Conservative Independent Baptist,” he said. “Against Women in Ministry Dispensational Premillennial Calvinistic Conservative Independent Baptist,” he said. “Unashamed Fundamentalist Against Women in Ministry Dispensational Premillennial Calvinistic Conservative Independent Baptist,” he said. “Pro-Disney Boycott Pro-Life Unashamed Fundamentalist Against Women in Ministry Dispensational Premillennial Calvinistic Conservative Independent Baptist,” he said. “MODERN VERSIONS Pro-Disney Boycott Pro-Life Unashamed Fundamentalist Against Women in Ministry Dispensational Premillennial Calvinistic Conservative Independent Baptist,” he said. “Aaauuugghh!! You heretic!” I said. And I pushed him over. Now that’s a humorous story. But in many aspects, it is sadly true. There is probably not one Christian on the face of this earth that agrees 100% with all the beliefs of any other Christian. The truth of the matter is that if we dig deep enough, we will always find areas in which we disagree with each other. And if we let these disagreements separate us, we will be forever pushing each other off bridges, and dividing churches, and arguing with each other. But, when we forget about what it between us, and focus instead on Who is Above Us—as Ephesians 2:13-17 encourages us to do—when we focus not on ourselves, but turn our eyes upon him,– all of these other things just fade into the background and it is then that we can live in peace with each other. Peace, that is what Jesus brought. It is what we can have … in Him. I enjoyed this reading. I undid my confusion. 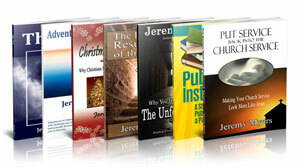 Would love to read others to help with my bible study.